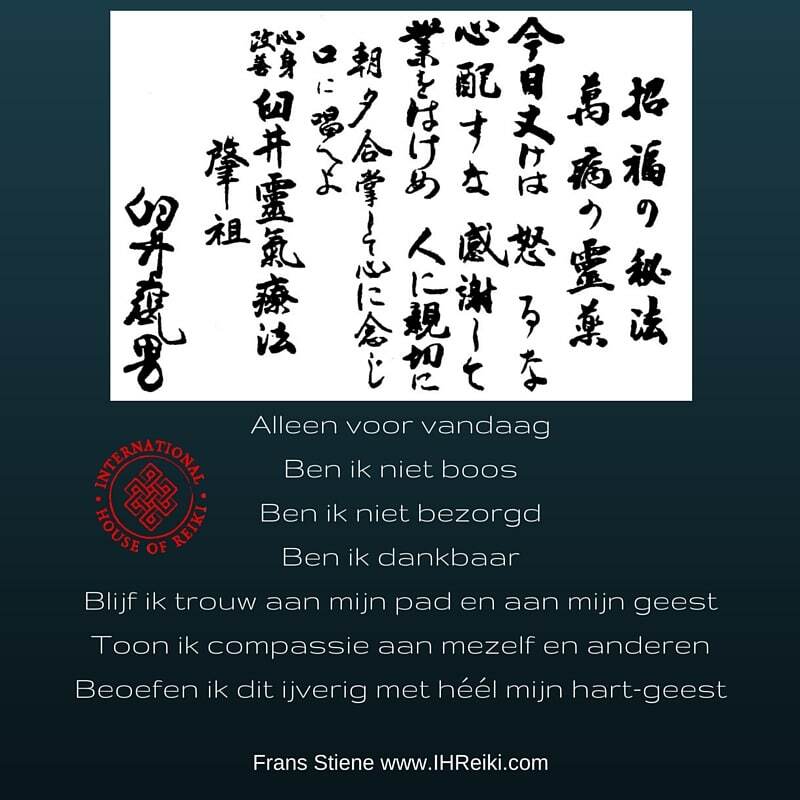 Listen to Frans Stiene chant the Reiki Precepts. Below is an excerpt from The Japanese Art of Reiki. 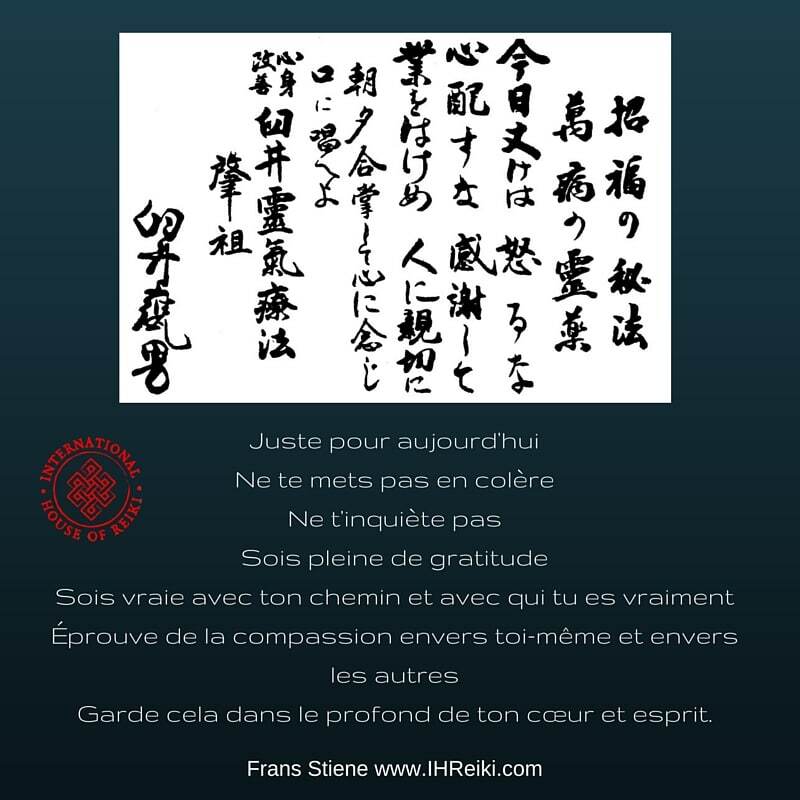 Above is a translation of the five precepts as taught in the system of Reiki. A precept is a code of practice. Usui taught them to support his students on their spiritual path of self-healing – they are the baseline to the complete system. These precepts are the teachings of Usui, the roots to what has become the system of Reiki. If one were to practice the precepts alone, the spiritual journey would be swift and triumphant. Their deceiving simplicity undercuts the struggle that is relentlessly experienced when working with them. Though the precepts may lie at the heart of the teachings, the enormity of this challenge prompted Usui to create other methods to support practitioners: these are the other four elements of the system of Reiki. 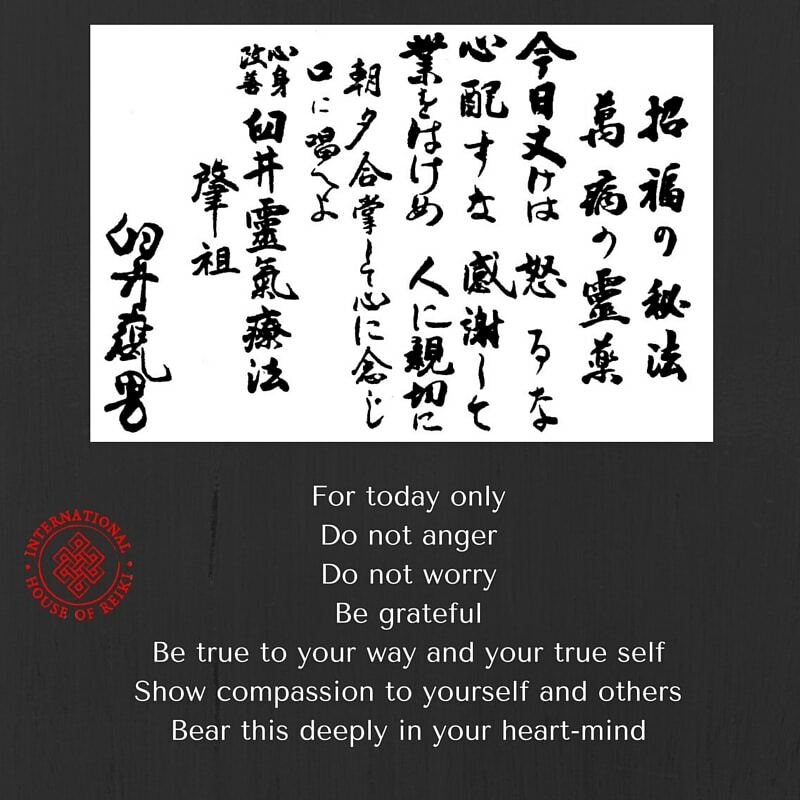 Apart from the five precepts found in the Japanese text, this creed of Usui also includes a brief introduction, directions for use and background informationii. The creed is in fact a set of fundamental beliefs and directions guiding practitioners on their spiritual journey. The word ‘precept’ generally means ‘rule of conduct’ and there are many of these in Buddhism, some for monks and nuns and others for lay people. In Japanese Buddhism, there are five precepts or gokai. They exhort a Buddhist practitioner not to: kill, steal, commit adultery, tell lies, and not to drink intoxicants. These precepts, however, must not be confused with the system of Reiki’s gokai even though some of the sentiments are similar. Usui, as he was want to do, took a component of a well-established form and created his own non-religious version. It is more likely that the precepts are the layperson’s version of the eight-fold path from Buddhism. The eight-fold path states that a practitioner must hold: right views, right thinking, right speech, right action, right way of life, right endeavor, right mindfulness and right meditation. The word ‘right’ according to Buddhist interpretation has specific connotations for a practitioner. Once a practitioner follows either the eight-fold path or the Reiki precepts the same quality of life can be experienced. The first precepts taught by Usui were translated into his own words from an older set of Buddhist precepts. These precepts were initially from the early 9th century and were used daily in the practice of Shugendô – according to Suzuki san. They were a part of his first teachings that were then adjusted to become the five precepts – as we know them today. Usui is believed to have taught precepts from as early as 1915. Within the context of Buddhism, at this time it was common for students to sit and write word for word their teacher’s commentaries and contemplations. This appears to have also been the case with the precepts.i It is generally believed that the act of writing is yet another method to help internalize the text’s meanings. Apart from precepts there were also gyosei, waka (short poems) written by the Shinto Meiji Emperor (1852-1912), which were taught and practiced in similar ways to Usui’s precepts. It is thought that their inclusion may well have been relevant to the times that Usui lived in. Today they are not widely studied – if at all. During the Meiji Emperor’s reign, as well as using the Buddhist influenced Reiki precepts, the Shinto influenced waka would have been politically correct to use.